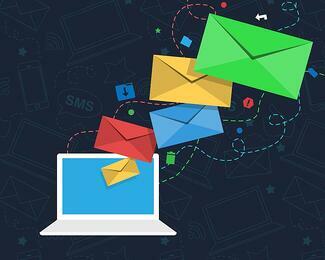 Marketers love Email Marketing and who can blame them? It works! However, there is a lot of conflicting information online regarding Email Marketing and how to do it right. One thing you'll learn from reading through these statistics is that while most companies are using Email Marketing, they admit they really don't know what they're doing. If this sounds like you, hopefully, the data will help answer some of your questions and provide a few relevant benchmarks for getting started. Mobile subscribers tend to read emails throughout the day when they have a free moment or when they aren't at work. If most of your subscribers are mobile, \test emails at various times outside of the traditional working day. This is good news -- most of the time when someone opens your email, they've actually taken the time to read through it. That means a positive ROI on your efforts for increasing your open rates. Mobile continues to dominate online readership and Marketers expect this to continue. Most businesses should prioritize the email experience for mobile users over desktop users. We know that the majority of readers are on mobile devices, but it's interesting that over a third of readers will only check emails from their phones while some others switch over to desktop. It shows that many people read emails on mobile for convenience, but actually prefer desktop. While there are plenty of companies who have success with longer emails, subscribers have said they tend to prefer targeted emails that are specific and get to the point right away. Test out short emails in your campaign and see how they perform for your business. Another statistic that shows how engrained mobile devices are in our lives. When mobile screens were smaller and not as sharp, most people didn't enjoy reading from their phone. Now that most phones have screens the size of our face and higher pixel density, reading on a mobile device isn't so bad anymore. It looks like people just need a reminder (or 30) to get them headed in the right direction. Normally I would think 30 hyperlinks in one email is extreme, but the data speaks for itself. Using the same hyperlink several times in one email is worth testing in your business. Less is more. While this severely limits what your subject line can say, it is worth experimenting with when you have a big announcement or in an area of your sales funnel where you struggle with open rates. If you handle Marketing for a professional association or nonprofit, these are current benchmarks to compare your success with. Businesses targeting consumers and other brands in the UK see more success using Email Marketing as a part of their strategy. The time of day matters, depending on the goal of your email. People are most likely to click the hyperlinks in your email in the late afternoon, most likely when they are anticipating getting off work. The more targeted your emails are, the better engagement you will receive. This is an interesting stat to keep in mind. It explains why I've seen Marketers use a phrase such as "give me your BEST email and I'll send you..."
The next time you're sending an email that you want to get read, but don't need to direct traffic, try sending it on the weekend. Your persona's inbox is filled with Marketing emails. Want to stand out? Start sending more emails that aren't directly promoting your product or service and try to make your emails more conversational. Some of the old ways of thinking when it comes to Marketing are still alive and well. The fact that a Marketer in 2014 wouldn't view the ability to measure and learn from campaign effectiveness as a good thing is mind-boggling. You have to measure progress to be able to improve your Marketing, plain and simple. This means your emails should be formatted to look good in Gmail and you should be doing everything you can for your emails to land in the "primary" tab. Most Marketers will agree that your email list is one of the most valuable assets to your business, but the majority also believe (as reflected in their behavior) that Email Marketing alone is not enough to grow your business. Despite all of the sophisticated tools available for tracking email metrics, the majority of Marketers still think that open rate is the only thing that matters. This means the majority of Marketers aren't getting the most out of their Email Marketing efforts. We believe a multi-channel strategy is the best approach to Inbound Marketing. Almost half of companies are just shooting emails out at random or they're just guessing. Email frequency is something that you can and should be testing for your organization. Email Marketing is something that most companies don't want to outsource, but looking at the other statistics, it's clear that they aren't getting the full benefit of their Email Marketing programs. That number is much lower than I would've guessed, but it still shows that your brand is competing for attention in your persona's inbox. You want to do everything you can to stand out in a good way. This statistic is shocking. One of the best things about Email Marketing is the amount of data you can track to directly measure the ROI of your email campaigns. Mobile devices should be your top priority in your Email Marketing strategy. Shorter subject lines and shorter emails almost always perform better. US consumers have several email addresses and receive emails from several brands -- the competition is steep. Most companies choose to handle Email Marketing themselves, yet they don't track much outside of open rates and they can't measure their ROI.